German-Swiss company Liebherr has established a global reputation as a manufacturer of construction vehicles, cranes and tools since the 1950s. Above all, its innovative mobile cranes such as the TK 10 series made Liebherr a popular brand during the European construction boom of the 1950s and 1960s. Since then, Liebherr has developed into an international engineering company making a wide range of high-quality mobile cranes in addition to construction and commercial vehicles. 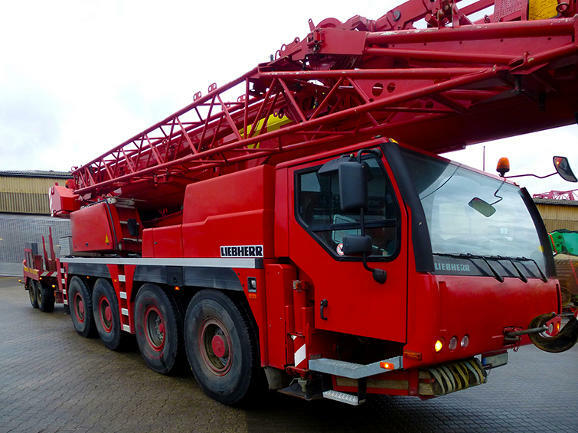 Used Liebherr cranes are highly sought after and are still in use decades after they were first manufactured thanks to their high durability. The popular entry-level models Liebherr 26 H and 32 TT had hook heights of up to 20 metres and a load capacity of up to one tonne. The 65 K and 120 K 1 models were designed as tower cranes and had an extended hook height of over 37 metres. Later came the lattice boom cranes in the popular High-Top EC-H, Heavy-Load HC and Derrick DR models. Among Liebherr mobile cranes, the 22 HM on a chassis as well as the 32 TTR and 81 KR on crawler tracks are very popular and have multiple uses, such as in civil engineering, forestry, bridge construction and even rescue services. Liebherr LTC series mobile cranes in different weight classes and the LTM telescopic crane series produced since the 1980s are now also market leaders. The MK series of mobile cranes with a crane height up to 37.7 metres (Model MK 140) offers the mobility of a standard vehicle crane with the flexible advantages of a tower crane. These models were specifically developed for practical one-man push-button assembly and are also often used for smaller applications. Taxi cranes were made for active operations, where loads needed to be lifted several times a day and often in different places. These highly flexible machines have modern mobile crane chassis and offer optimum manoeuvrability. Several electronic driving programs help these machines manoeuvre. Didn't found the right one yet? Get in touch with us and we'll find it for you.